A classic board game that every single person on earth has played for more than a century now is known as Monopoly. It is a real estate trading game where people pretend to be a real estate tycoon and plays it for the fun and excitement that it gives. If a person has played the Monopoly game long enough, he or she will begin to realize that the game provides us a lot of financial lessons and wisdom that can be applied into the real world of investing and finance. But, what if the world's most popular board games go to Live Casino from Evolution Gaming? It is surreal. Know how to join the fun and how to play by finding out more about it below. Live Casino games are interesting and extremely fun no matter what. The company created Monopoly Live and is only available on their website. It is the most unique and trendiest live online game show that is based on the most popular and most loved board game on the planet. It is a special edition of their notable game known as the Dream Catcher, and people can now access the world's leading money wheel game through Evolution Gaming. Monopoly Live is full of suspense and excitement where players have the ability to participate in the unique game elements of Monopoly. Board elements such as the Chance, Go, Community Chest, hotels, houses, jail, and Super Tax are included in the game. It combines reality and live game action and redefines the entertainment that people experience through Live Casino since it gives each player a chance to win massively. The primary objective of the Monopoly Live by the world's number one live casino provider is to simply give players a live game where the host spins a vertical and large-sized mounted wheel where players have the power to predict the segment and where the wheel will be stopping at right after it spins. There will be a virtual Mr. Monopoly just like from the board game itself that will sit on the side and is ready to jump right into the action. In addition to this, the game offers plays the chance to bet on the wheel where it stops on a certain number and includes the word “Chance” segments for automatic cash multipliers and wins, there will also be “4 Rolls” and “2 Rolls” segments where it activates an augmented and captivating reality, a 3D bonus game will appear around the adventures of Mr. Monopoly. 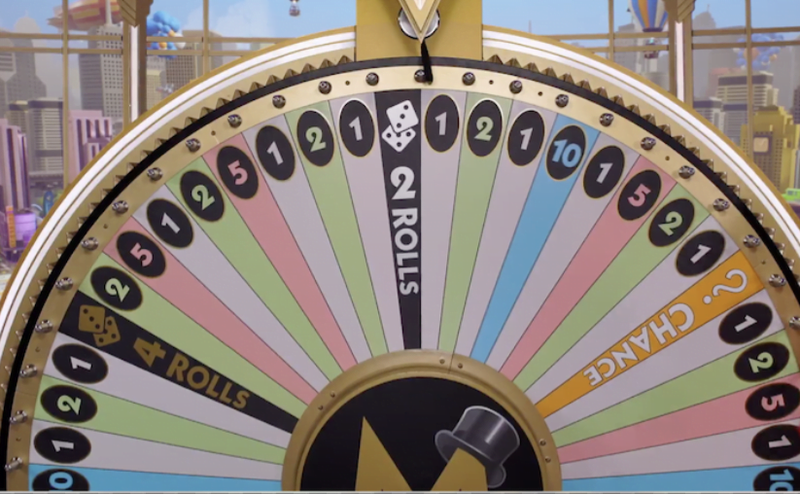 Each and every player will then place a bet on a particular number that they have a feeling where the wheel will stop specifically at 1, 2, 5, 10, 2 Rolls, or 4 Rolls. If a player was able to bet on the right number they will be able to win a similar payout. But, if the wheel stops on a “Chance” segment, all players will be granted a Chance card that will be given out by Mr. Monopoly himself and the card has the capacity to show a random multiplier bonus or a random cash prize. The bets of each player will remain in place if the card shows a multiplier bonus. Afterward, the host of the game will spin the wheel once again, and if a player obtains a multiplier once more, the multiplier that they earned will be multiplied. Last but not least, the bonus game shall begin if the wheel will stop at either 4 Rolls or 2 Rolls where qualified players enter the 3D world of Monopoly with various prizes, multipliers, and a lot more. PreviousPrevious post:The History Of Roulette Around The WorldNextNext post:New generation of Microgaming table games – Roulette! New generation of Microgaming table games – Roulette! Are Live Casino Games Fair in India?